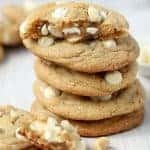 Our family's favorite White Chocolate Macadamia Nut Cookies. Soft centers, crisp edges, white chocolate chips, and macadamia nuts. Two special ingredients make these cookies the best! In a large bowl, using a hand mixer or stand mixer, beat butter and both sugars for 2 minutes, scraping the bowl as needed. Add egg and extracts and beat until combined. Slowly add the flour mixture, beating until just combined. Add 3/4 cup each white chocolate chips and macadamia nuts and stir until well combined. Scoop 2 tablespoon portions of dough and place the dough balls a couple inches apart on the cookie sheets. If desired, top each ball of dough with a few additional white chocolate chips and macadamia nuts (this makes for a prettier cookie). Place the baking sheets on wire racks and allow the cookies to cool completely. *Optional: I like to press additional macadamia nuts and white chocolate chips onto the top of the cookie dough balls (before baking) to make the cookies look a little prettier. **Bake time: Pulling your cookies from the oven when they are still slightly underdone will result in the perfect texture - soft centers with crisp edges. Oven times vary, and the size of your dough balls may vary slightly from mine. Keep an eye on them. When the edges are set and the very center is still slightly underdone, pull them out and allow them to cool with the baking sheet set on a rack.